Best price new Mazda CX9 – maximum discount with highest level service. We’re saving new Mazda CX9 buyers $1000’s every week securing Australia’s best Mazda CX9 deals. Choose any new Mazda CX9 model and the options you want. Be it the new Mazda CX9 Sport, Touring, GT or Azami. You’ll get the best price without having to go head-to-head with dealers. 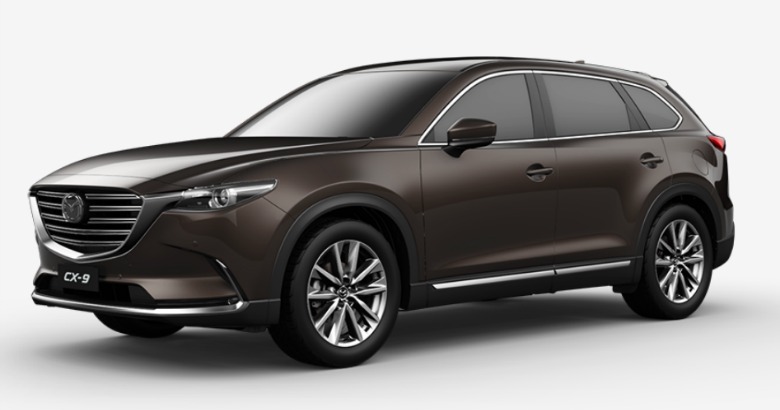 Yes – we’ll make sure you get the highest possible price for any car or cars you may be trading in as part of buying your new Mazda CX9 – or any new car. Class leading levels of safety equipment. The first Mazda to combine Mazda’s SKYACTIV technology with forced induction. Engine 2488CC, 4 cylinder, dohc, turbo. Max power: 170kW at 5000 rpm. Max torque: 420Nm at 2000 rpm. Because of the significant increase in torque (from the previou CX9), the new generation Mazda CX-9 is said to drive more like a diesel. The torque is available from just 2000 RPM making the CX-9 drive feel effortless… muscular, low in the rev range which is where families will mostly use it (a high revving engine isn’t necessary in a family SUV). This new CX-9 is more efficient by a significant 25%. Fuel economy: 8.8L per 100km. A big improvement here. The previous model was into the 11’s ?. Available in front and all wheel drive (AWD). Every CX-9 model gets Sat Nav, Reverse Camera, Parking Sensors, Autonomous Braking and Blind Spot Detection. One touch clip and fold system for releasing third row seating. CX-9 cabin is reported to be ‘hush’. Mazda’s are sometimes accused of having higher levels of road noise than some of their competitor’s models but this is reportedly not the case with the new CX-9. Taut body control helps the CX-9 corners very nicely – especially considering this vehicle has nearly a 2 tonne mass. Potential Weaknesses: No diesel option. Ride: Some say not as supple as you’d expect (it is a big car though). Brakes can take a little getting used to due to an initial lack of bite on the pedal – a little more pedal pressure is needed than you initially think. Overall though, the new Mazda CX-9 is polished, keenly priced and brimming with safety features and comforts. A practical, spacious and very comfortable family hauler. Definitely one of the best (if not the best) offerings in it’s class.